The Toyota Prius is mainly known for being a hybrid vehicle. This means you get excellent fuel economy. You can even go up to 25 miles on just an all-electric charge. It's a fantastic option for anyone concerned for the environment or those who simply want to save money at the gas pump. It also has a sleek and stylish look with some nice exterior features. 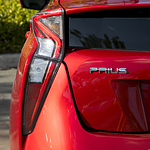 The latest iterations of the Prius offer a sleek overall design. This dramatic styling is unmistakable and sure to turn some heads. It has a practical application as well. The exterior shape was designed for aerodynamics and great performance. To see and drive one yourself, you can always stop by Don Ringler Toyota. The next exterior feature to note is the use of LED lighting. Bi-LED lighting is used in the headlamps, fog lights and available accent lights. This is both functional and stylish.